Happy man: Angelo Valiante goes to cut his 100th birthday cake. FOR a larger-than-life mural to be created in the main street of a resident’s hometown is a rarity and privilege. When Angelo Valiante first viewed his esteemed depiction, just a stone’s throw from Stanthorpe’s main street, the centenarian revealed the humour for which he’s well known. “Now they’ll paint the queen next to me,” his daughters Lina Scalora and Nina Ricca recalled his words. 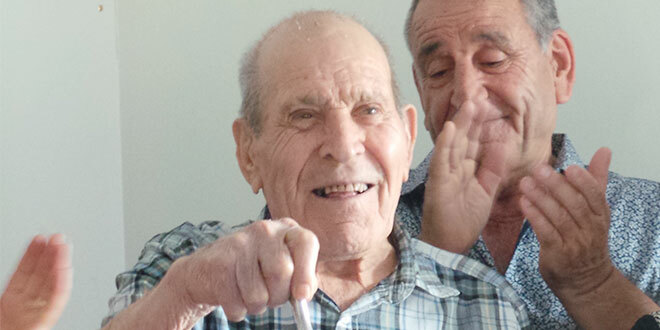 The beloved father of three, Nonno (grandfather) of six and Bis-Nonno (great-grandfather) of nine celebrated his 100th birthday on November 21 with ongoing festivities including a family gathering in Stanthorpe, in Toowoomba diocese, on November 23. A jovial Mr Valiante was joined by his three children, including son Michele “Mick” Valiante, from the Gold Coast, and extended family members for the long-awaited event. Over a coffee, post celebrations, locals Nina and Lina shared their jubilation in having marked the milestone as a family and talked of their father’s lifelong characteristics of humour and hard work. “Dad has always been a happy person,” Lina, short for Pasqualina, said. “(And) a hard worker … very fair but very tough,” Nina, an abbreviated form of Antonina, said. 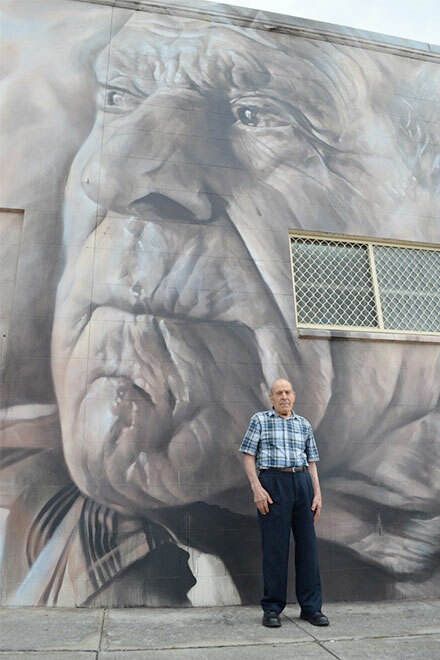 Their father’s mural was created over three days, by Brisbane artist Guido van Helten, as part of a 2016 arts and music festival. The Stanthorpe Border Post newspaper reported that the mural “pays homage to the members of the Italian community who have helped make the region what it is today”. Stanthorpe Regional Art Gallery also featured a portrait of Mr Valiante, by Jacques van de Merwe, as part of tributes to many contributing locals. Mr Valiante was born in the village of Jelsi, in Abruzzi, east of Rome. He had two sisters, a step-sister and a brother, and their parents were said to work as “contadini” (in farming). Obligatory military service was soon met by the young Angelo’s reluctance as a fighter in the Italian army in 1940. Captured in North Africa in 1941, Mr Valiante was transported with others to “an unheard of land called Australia”. He was also quoted as saying he thought it was “like being taken to hell” but in reality, as farm workers, the group was said to have been “treated well by the authorities”. Working on a farm on Eukey Road, Ballendean, south of Stanthorpe, Mr Valiante befriended the Manning family for whom he had “great affection”. In February 1947, Mr Valiante was repatriated to his hometown in Italy and married “long-time sweetheart” Rosaria who “had waited for him for seven years”. The family’s migration to Australia, when Mick was a babe in arms in 1950, was sponsored by the Manning family and it happened that they settled in the same house where Mr Valiante had lived as a prisoner of war. Angelo and Rosaria Valiante bought their own nearby property in 1955 and, with two daughters also now in tow, began clearing the land to make it their own. Family memories were of happy and hardworking times with a constancy of Mass attendance on Saturday nights “no matter what”, the sisters agreed. In 1973 the Valiantes sold the family farm and retired closer to town, their love of shared time with family and gardening continuing. Rosaria was being cared for in a local nursing home from 2004 with her husband at her side daily, always “feeding her dinner”. She died in recent years. Mr Valiante’s granddaughter Rosalie Webb wrote a special tribute to her Nonno as part of his 100th birthday celebrations. Rosalie wrote emotively of the Nonno who was “a hardworking man, strong and healthy”. “He always wanted to help, he was always ready to joke and have fun … he always played with us, played tricks on us, always laughing, telling us a story here and there from his past,” she said. Vegetable and flower growing were the pursuits Rosalie fondly remembered because “as long as he was working outside, he was always happy”. With “not a weed in sight” and an imaginably “immaculate garden” as her Nonno’s trademarks, Rosalie also believes the “secret” to Mr Valiante’s longevity might be in the glass of red wine he consumed daily with meals. She and all the family still enjoy their patriarch’s company and energy. “The positive energy that surrounds him is amazing,” Rosalie said.